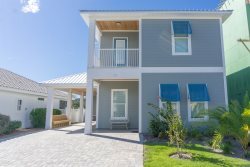 Zoe`s Place~ Impressive 5 Bed/4.5 Bath Newly Constructed Beach Home in the Fabulous Private Community of Emerald Waters Village! Property Size 1,422 sq. ft. Welcome to your one story cottage located in Emerald Shores! This community of homes has 2 swimming pools ( one heated) with tables, umbrellas, chairs for sunbathing, and restrooms. There is a tennis court with basketball and shuffleboard. The beautiful white sand beaches and clear emerald ocean is less than five minute walk away. (Tram service is provided but is seasonal) Emerald shores has private beach access via its own beachfront pavilion. It provides restrooms, picnic tables, wagon parking ,and a Tiki Bar, open during the summer season. You will be within walking distance to Pompano Joe's, Captain Dave's and Kenny D's Restaurants. 7Seas is a single story home and a new addition to our rental program. This Perfect family home has never been on a rental program before, It was used just for family visits. The kitchen boasts the latest granite countertops with all brand-new stainless steel appliances. All bathrooms are equipped with granite countertops as well. Master Suite has a King bed with Private Bathroom which has gorgeously designed walk in stone rain shower!! 2nd Bedroom has a King and shares the guest bathroom with the Bunk room which has two sets of bunks (4 twins) great for the kids! Come enjoy the best kept secret in Destin.... Emerald Shores, where you can experience an UNFORGETTABLE Destin Vacation! Book Online today! Final Payments due 60 days prior to arrival ,system will automatically charge on due date. Gated community with 2 Pools, one heated. Tennis court, Shuffleboard, Basketball Private Beach access with Covered Pavilion, bathroom facilities and beach service.